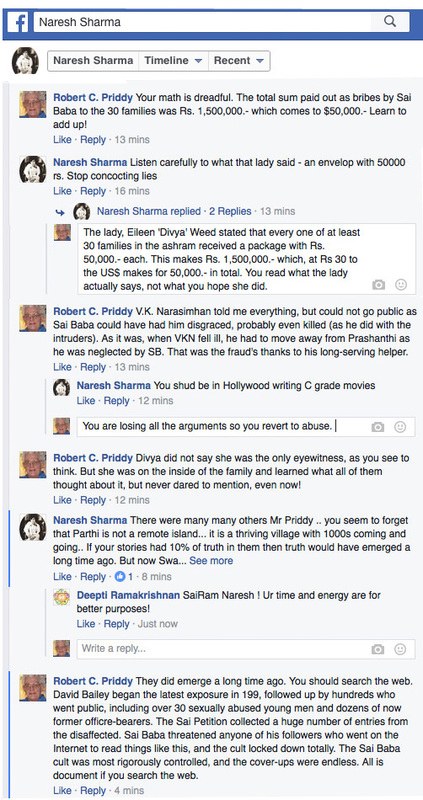 A deeply indoctrinated follower of Sathya Sai Baba (as are all current followers), Naresh Sharma, tried to comment on a video in which I interviewed an eye-witness Eileen 'Divya' Weed, an insider eye-witness of the murders in Sai Baba's rooms in 1993. 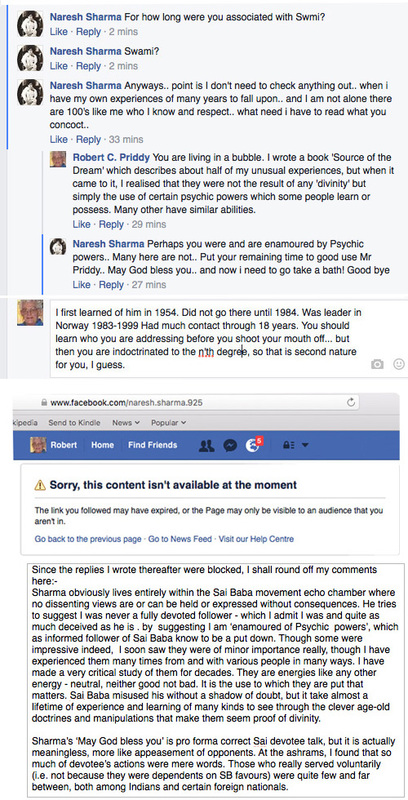 The comment was denied by Divya on her much visited and remarkable YouTube posting Murders in Sai Baba's Mandir Puttaparthi 1993 Perhaps to show his spiritual zealousness to other cult members, Sharma called me 'the Lord of Lies' (See his comments scanned at the foot of this page) - also accusing me of laughable errors (even arithmetical) about the issues and the sums in bribes paid by Sai Baba. These comments and his subsequent attempts to defend them give an interesting glimpse into the so-called 'Sai cult echo-room' i.e. the remaining indoctrinated followers who are isolated within their 'spiritual circles' and personal time-space cocoons from the major on-line and media exposures of Sai Baba's massive failings and unpunished crimes. He claimed the boys who slept in Sai Baba's rooms were pure and indirectly implies that they were not sexually involved. However, the entire furore about these abuses came to light within the Sai movement (and the world press) when a number of students asked for help from their concert pianist music teacher to get Sai Baba to stop these abuses. That eventually brought forth a flood of testimonies and affidavits from others who fell foul of Sai Baba's sexual and many other abuses.The Sai Baba scandals which broke from 1999 onwards were taken up by many top international news outlets (see documentation) and by UNICEF, the US State Department, UK Parliament etc. and it took the combined force of the devotee Prime and Home Ministers to suppress the CBI investigation when it was close to delivering its guilty verdict. 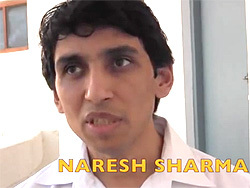 Naresh Sharma attacked me without even trying to find out how deeply I - together with my wife - was involved as a devotee and Organisation leader (in Norway) for 18 years, working tirelessly in selfless service, attending world-wide conferences and donating large sums of money, also writing a popular book on my experiences until 1994 ('Source of the Dream'). He had no idea about V.K. Narasimhan, who was compromised by his inability (under potential very serious threats from Sai Baba) to speak his mind - though he did so in strict privacy to me and my wife. Narasimhan felt that, despite all the corruption and abuses, the Sai Baba workers and international donors were doing good for the poor and under-privileged of India. This, however, is a truth with many modifications.